Looks like a few of us got the right idea and made it out to Alaska recently for some outstanding fishing. I'll give you a short recap since the link below is from my buddy in Anchorage who posted alot of our trip on an Alaskan Fly fishing forum. We fished the Kenai Peninsula all the way down to Homer. Bodies of water included the Russian, Kenai, Anchor, Ninilchik and Deep Creek. Fish targeted, or unfortunately caught ie: "Reds" included Coho, Rainbows, Dolly's, Pinks, & Steelhead. While we used Egg patterns most of the time I used my Swinging addiction -sorry fellas not that kinda swingin but with Egg sucking Leeches kind to rip a bunch of Silvers, Steelheads and everything else man what a feeling to have them grab this and run! I started out with a guided day trip on the Kenai and had a blast catching close to 50 fish that day....okay we parted the Red sea but many non-sockeye fish saw the bottom of my net. South Lower KP Creekin with some Egg Sucking Leeches! 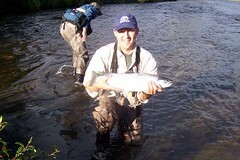 Colin with a Bruiser on the Kenai! Long Day of Rainbows..Nonstop Action! Awesome trip, great weather, Fall Foliage, only 30 minutes of rain while fishing the whole time, few crowds in Lower KP, not to expensive and booking my trip for next Summer very soon. Pink Salmon Late July through mid-August on every even year. 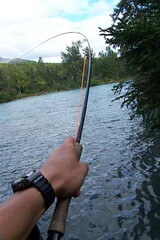 Trout fishing on the Kenai River is always good, and more often than not it is great. If the salmon pursuit is slow, it seems you can always depend on the trout to save the day. Some years are certainly better than others and to the extent we find angling success for trout is largely related to what else...the salmon. You see here in Alaska, trout and salmon are forever connected. The salmon's mysterious life cycle is everything but a mystery to the Kenai's thriving trout population. Unlike famous trout streams in the lower 48 where astute anglers cast hand tied replicas of mayflies or caddis, the Kenai is an underwater show, almost entirely subsurface. In a river the size of the Kenai, it seems there is enough food on the river's bottom to make the rise to the rivers surface a waste of time and energy. One might argue that one big bite of salmon flesh or loose spawn has 100 times the nutrient value of one aquatic insect. From the trout's perspective, why waste your time chasing a snack when a full course meal is all around you. When the millions of Pacific Salmon return to their natal Kenai each summer, they bring with them a vital store of energy from the ocean. Years of intense feeding in the North Pacific has allowed them to double in size many times before heeding the instinctual urge to come home and spawn. Protein that once took the form of krill or herring is now transformed into pulsing salmon flesh on a one way mission to reproduce. Once the salmon's first life expires, another begins. A dead salmon becomes many things and if you're trying to catch a trophy rainbow in the Kenai River, flesh and eggs are life after death. Of course the tremendous tendency trout show toward these two food sources should not surprise us as it follows trout tendencies worldwide. Trout (much like those that pursue them) are opportunists. They are simple taking advantage of the most prolific, available and overall nutritious food source. Just like more "traditional" trout in fabled places like Montana or Idaho that sip incessantly at floating insects, they are eating what's in front of them. 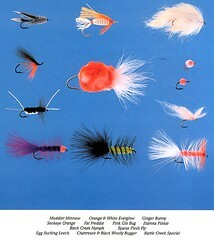 Not that Alaska does not have plenty of floating insects, it is more that Montana does not have millions of salmon. You see my point. So when it comes time to pursue your trophy rainbow in Alaska, think salmon. By this I mean focus on the salmon bi-products(s) that the rainbows eat. Once you have accepted that your #16 deer hair cadis is not the best bet, you're well on your way. You may wonder if any 'ol bunny flesh pattern or glo-bug will do the trick or if the size and pattern of flesh and egg are important? The overwhelming answer is most definitely yes. A refined flesh and egg pattern is essential. Perhaps nothing illustrates this more plainly than when I see another boat using clusters of real salmon eggs and occasionally catching very few small fish and I am drifting with artificial single egg patterns, consistently landing many more and far larger trout. You might think it would be the opposite, but big trout don't get big by being stupid. They are looking for the real thing, the food they eat day after day, year after year. They do not see clusters of eggs (unless they have a hook attached) as all the eggs that come from the salmon are in single egg form. When the female salmon lays her eggs in the gravel they have already separated from the skein. Inevitably, thousands will not get buried and the trout depend on this loose single egg spawn for the bulk of their mid to late summer diet. I have caught many, many trout that have so many single eggs in their mouth that they cannot close their jaws and the translucent light orange salmon eggs are pouring out both sides. Often the eggs are mixed with rocks and this is an indication that the trout are actually digging into buried salmon redds to root out the buried treasure. It seems this pirate behavior is more often displayed by the rival dolly varden (much like a trout, but actually a char). They inhabit the same water and share similar habits, but their physical appearance and fighting styles are distinctly different. 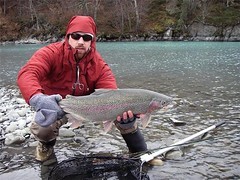 Dollies and arctic char have a sleek chrome-like exterior that lacks the pronounced scales that a rainbow possesses. Instead they have random pink spots scattered along their flanks. We have both resident and anadromous (sea-run) dolly varden and they can be best distinguished by the coloration on their bellies. Those that have arrived from the ocean will have clean, white undersides, the telltale marking of ocean camouflage. Those that have wintered in the Lake have a silty sometimes-blackened appearance. Both will take on extreme coloration changes including white fins and flame orange sides, and lips as they begin to spawn in very late fall. Dolly Varden and Arctic Char spawn last in Alaska's long line of annual spawners. Guess who spawns first? The rainbow. Adult rainbows begin to concentrate on spawning in late March on the Kenai and the spawn seems to last throughout April and into May. The fish congregate in certain distinct gravel laden sections of the river, many of which will host returning salmon in the coming months. From the air, I have surveyed these packs of rainbow trout. They school together in large groups when the river is just shedding winter ice and snow and flows are low and clear. Many are the size of salmon and larger, indeed the Kenai is the home to a monstrous strain of rainbow trout. Some become easy picking for hungry eagle as their backs dimple the shallow waters near the rivers edge while spawning. Perhaps at no other portion of the year do so many of the rivers large rainbows congregate in the same place and there can be no doubt that many fish over twenty pounds are present. Wisely ADF&G closes trout fishing between April 15 and June 16 to allow the trout ample time to complete their spawn. They escape disturbance from the many salmon anglers, soon to come. Trout alter their feeding habits during reproduction. They get skinny and very colorful in their competition amongst peers. Once they finish their spawn, the trout quickly look to the river for food and nourishment. When the water rises and the current becomes stronger, it awakens them to the approaching summer and they feed with more intensity by the day. Below Skilak Lake in the Kenai National Wildlife Refuge they share their spring retreat with nesting Trumpeter swans who enjoy their own spring protection in a three-mile sanctuary of the river below the lake. Until June 15, no motors are allowed here as to not disturb the swans. This protection is a haven for the rainbows who spawn in the same waters, as do thousands of salmon annually; their protein rich bodies littering the bottom. With this abundance of dead salmon as well as outward migrating juvenile salmon smolt, the rainbows recover from their spawn magnificently. 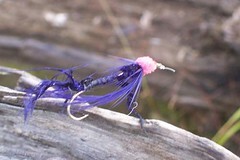 They take on a nickel bright sheen and strike a lure with unfathomed ferocity. Their first reaction to being hooked is to exit the water in multiple summersaults. It is not uncommon for them to clear the water as many as ten times in a matter of seconds, completely out of the water with every amazing leap. Unlike the dollies that seldom jump, the rainbows are masters of the air and this makes them very exciting to catch. With the real big ones, that first leap is enough to put a lump in your throat. It normally is touch and go for the first half of the fight as the fish does really whatever it wants. Incessant leaps and slack line runs are normal tactics. Once you finally turn the handle enough to catch up, it's frightening to feel their sheer strength. They take our long noodle rods to the back bone with ease and with 6 lb. monofilament, these hearty wild trout definitely have the upper hand (or fin). For the many that have finally slipped unwillingly into my rubber catch and release net, there are many others that said goodbye in mid air, throwing the hook in protest or snapping the leader with one head shake. 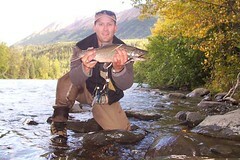 Through the years our passion for trout fishing on the Kenai has grown and with it our respect for these great fish. Since I began guiding I have always felt that visiting anglers should not just focus on our renown salmon fishing, but also spend some time releasing the river's most prolific year round residents. Pursuing the trout will lead you to the Kenai's most beautiful sections, often away for the hustle bustle of salmon fishing. It will find you surrounded by calling loons and mountain backdrops. From the moment you hurl your line upstream and sink back in your seat, you'll know a day of trout fishing was the right thing to do. 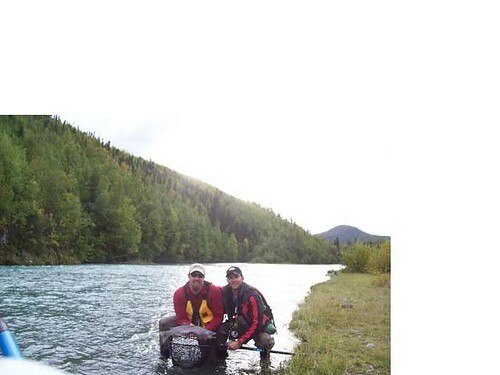 The Kenai River is host to some of the best Rainbow Trout fishing on planet Earth. With millions and millions of salmon returning to spawn each year, the Kenai produces an incredible food source for its native, wild trout that can not be described in human terms. Let’s just say that Kenai River rainbows are not on the Weight Watchers program. Alaska Troutfitters specializes in the pursuit of these "Fatties" and give anglers the chance to experience this truly world-class fishery first hand. From drift boat float fishing on the Kenai River, to professionally guided hike-in fishing trips on smaller tributaries and streams; Alaska Troutfitters has got Kenai Peninsula Rainbow Trout dialed. 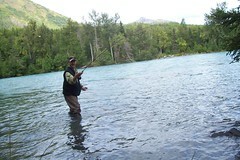 We divide the Kenai River trout fishing into four different sections of river. Each is unique with its own style of fishing, river structure, and scenery. This is where it all begins. The mighty Kenai begins its first flows out of Kenai Lake and steadily runs seventeen miles downstream through the drift only Kenai National Wildlife Refuge before entering into another massive glacial lake called Skilak. Its entire length is a massive spawning ground for the millions of pacific salmon that call this special river home. It is also home to some of the best fly-fishing for trout in the world, and is the perfect section of river for the beginner or expert to experience Alaska trout fishing for the first time. Surrounded by the massive peaks of the Kenai Mountains, the upper Kenai is a breath-taking display of Alaskan beauty. 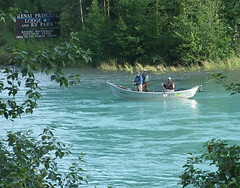 With its many braids, back channels, and gravel bars, the upper Kenai offers many unique ambush points for Rainbow Trout and Char on the fly. Fish average 16-18 inches with trophy fish in the 26-28 plus inch class caught regularly. The fishing begins in this section of river on June 11th and continues through the end of October. We fish and float this limited guided section of river with our custom 20 foot Willie drift boats with a maximum of four anglers per boat. This is the last 3 miles of the upper Kenai’s descent into Skilak Lake, and is also the most wild and remote section of the Kenai. 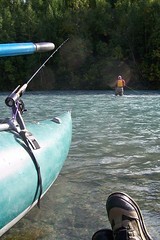 This is an awesome addition to our full day Upper Kenai River trips. The canyon section offers anglers the chance at hooking some of the upper Kenai’s more magnum rainbows and char, as well as providing scenery that will take your breath away. From whitewater canyon runs to the smooth, braided sections of river just above the lake, this section of river is truly legendary. At the end of the day, kick back and enjoy the glacial views as you cruise out across Skilak Lake. Please note that Canyon trips may be delayed or cancelled due to the uncontrollable weather on Skilak Lake. This section of river begins its flow out of Skilak Lake and slowly winds downstream before it enters a gorge called Naptown Rapids. The Middle is a very wide and deep section of river with tons of classic submerged river structure and massive salmon spawning areas. Fish average 18 inches and fish in the 26-30 plus inch class are seen almost daily. More Rainbow Trout in the 12-18 pound class (that’s right, pounds) have been caught and released in this section of river over the last 10 years than any river in the world. Alaska Troutfitters guides pioneered fly-fishing tactics and techniques for the monster rainbows that inhabit and migrate into this section of river. This is primarily a boat fishery and is highly recommended for experienced anglers searching for their fish of a lifetime. This is where some of the biggest and baddest Rainbow Trout in the world come to party, are you ready? Maximum of four anglers per boat. Alaska Troutfitters offers guided hike-in fishing on several of the Kenai Peninsula’s smaller mountain streams and rivers for Rainbow Trout, Arctic Char, and Steelhead. If hiking up and down rivers sight fishing for trout and char, or swinging articulated leeches for chrome Steelhead right out of the salt gets your casting arm twitching, this is the trip for you. The Russian River is a major tributary of the Upper Kenai. It originates out of two crystal clear mountain lakes and rapidly runs its short course through the Chugach National Forest eventually merging into the aqua blue waters of the Kenai River. The Russian is a textbook pocket water trout fishery with plenty of boulders, riffles, and crystal clear pools. This river fishes well from its opening on June 15th through September and can provide some of the best dry-fly fishing in Alaska for Rainbow Trout in July and early August. The Russian River receives two distinct runs of Sockeye Salmon providing insane amounts of flesh and eggs for the trout to gorge on in the fall creating a fly fishing Mecca. This crystal clear, slow moving creek originates out of the Kenai range and gradually winds through Spruce forest before entering the massive glacial Kenai Lake. In August, this quite stream becomes a Sockeye Salmon spawning war zone that attracts thousands of Arctic Char/Dolly Varden into the fray. Sight and indicator fishing egg patterns for these worthy game fish among hundreds of spawning Sockeye Salmon is the name of the game. Be ready for that sleeper rainbow hiding in the log jam. We begin fishing this creek July 25th and offer trips through August. This is a wonderful hike-in trip for beginners and mellow hikers. pounds of chrome bright steelhead. The fish is staring you down right in the eye as you remove the hook from its corner jaw. You grasp his tail and release him back into the cold, October water. You pick the sea lice off of your wool glove and begin shaking, but not from the cold. You feel it? We feel it too.